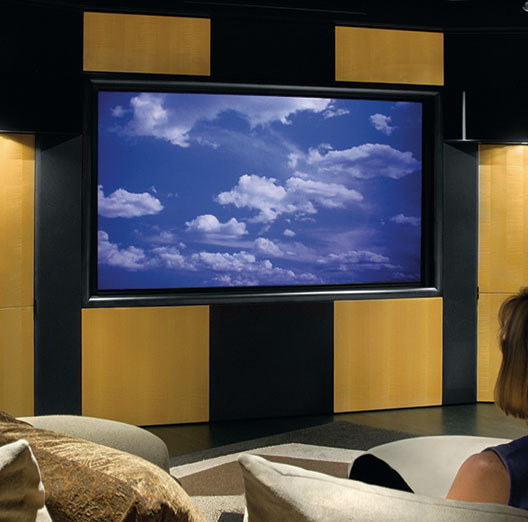 With more than 100 years of history in manufacturing, Draper is one of the worlds leading producers and distributors of home theater projection screens. 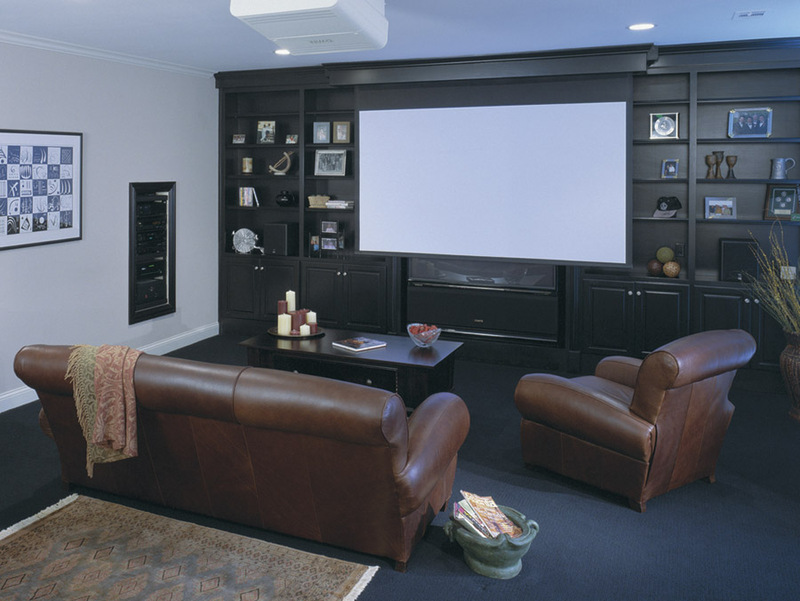 With proven durability and exceptional quality, there is a perfect draper screen for you. 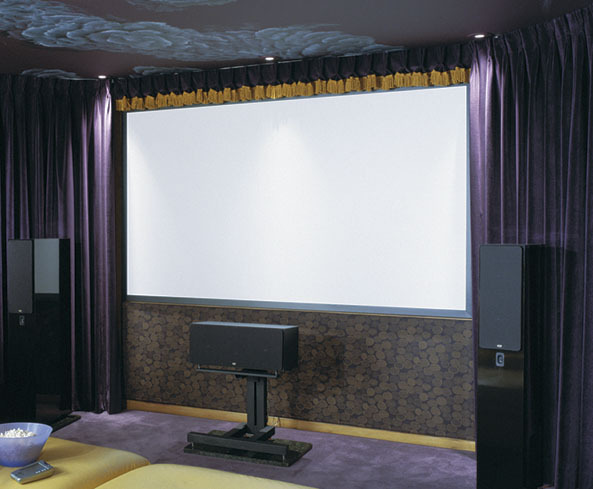 If you are unable to find a product you are looking for or you have any customization questions/requests, please feel free to call us and speak with one of our Home Theater Specialists. Premier - Black pentagonal steel case, motor in roller for smooth, silent operation. White case available. Silhouette/V - Streamlined extruded aluminum case without exposed fasteners or mounting fixtures. Screen and dowel retract completely inside case. Standard dove grey, white and black available. Baronet - Compact, inexpensive motor in roller screen. Scratch resistant white polyester finish. 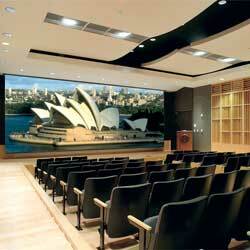 Paragon - Great for auditoriums and large halls. Motor in roller. Designed for suspended installations. Rolleramic - Ideal for larger installations. All wood case may be ceiling recessed or painted to match surroundings. Ships black. Salara - Attractive elliptical extruded aluminum case featuring floating gunlatch brackets and domed end caps. Motor in roller. Salara Plug & Play - Identical to Salara but no wiring necessary. Comes with built in IR receiver, remote, and 10’ power cord. Silhouette/E - Slender, contemporary design. Screen and dowel retract completely within case. Removable front fascia for service. Ships with dove grey case. White or black available. Access/V - Install the case first, then screen later. Motor in roller. Access MultiView/V - Ultimate flexibility with independent motorized masking system installed in the same case. Second motor in roller converts screen to 4:3. 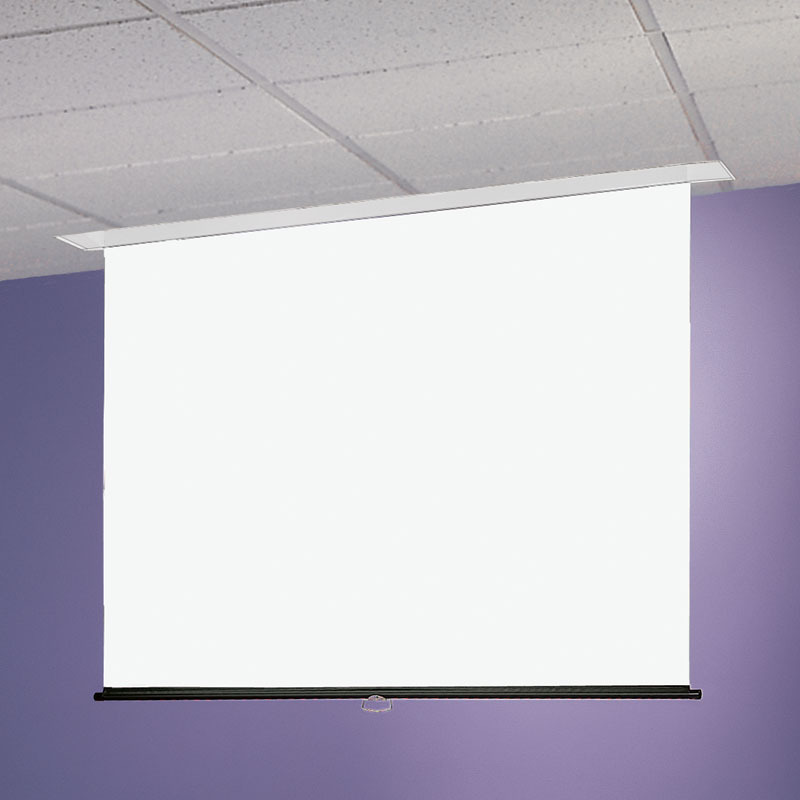 Signature/V - Features an independently motorized aluminum ceiling closure for virtually invisible installation when closed. Access/E - Flexible installation options with case first and screen later. Features motor in roller design. 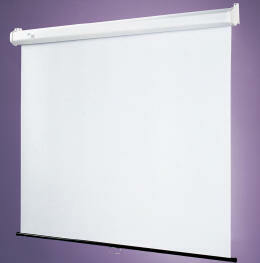 Access MultiView/E - One Access screen, two formats, with motor in roller design. Black masking on second motor in roller assembly. Ambassador - Direct drive heavy duty for installation above any type of ceiling. Hand crafted of the finest quality components with fast, dependable operation. Black all wood case. Envoy - Designed with conference and meeting rooms in mind, with motor in roller for long life. Easy installation, featuring ceiling closure panel that can be finished to match ceiling. Signature/E - Features automatic ceiling closure with concealed hinges for clean installation. Ultimate Access/E - Install case first, screen later. Features motor in roller. Ceiling closure opens into the case with smooth, fluid movement. Silhouette/C - Easy to install. Slender, streamlined design. Includes detachable polished aluminum crank handle. Ships dove grey but white and black cases available. Luma - High quality inexpensive pull down design. Spring roller operated. May be wall or ceiling mounted. 2” black masking standard on 16:9 and 4:3 format screens. Ships white. 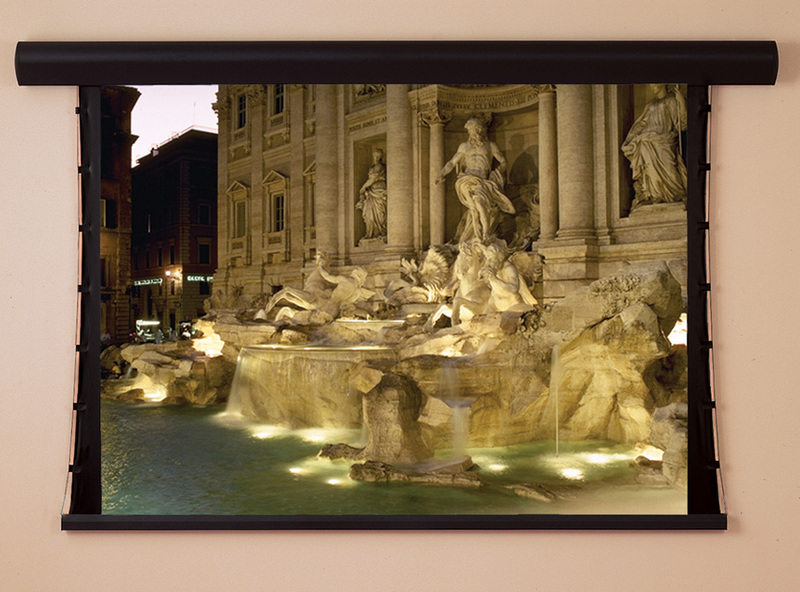 Luma w/Black Masking Borders - High quality inexpensive pull down design. Spring roller operated. May be wall or ceiling mounted. 1:1 (square) format. Ships white. 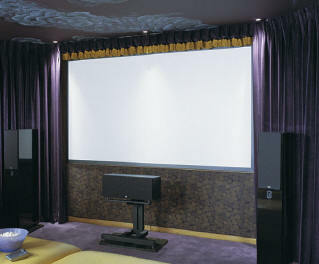 Luma 2 - Heavy duty wall or ceiling screen for years of dependable operation. Spring roller operated. Scratch resistant white polyester finish. Black available. Salara/M - Elliptical extruded aluminum case with domes end caps. Features nearly invisible gunlatch wall brackets. Ships white. Silhouette/M - Sleek and slender design with no visible fasteners. Ships dove grey. White and black finishes available. Star - Sturdy, durable construction ideal for classrooms. Cylindrical steel case is scratch resistant white. May be wall or ceiling mounted. Ships white. 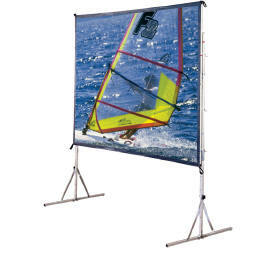 V Screen - The only screen with a 5 year warranty. Spring roller operated. Reasonably priced for heavy use. V bar aluminum support attaches to any wall, ceiling, or map rail hooks. Ships white. 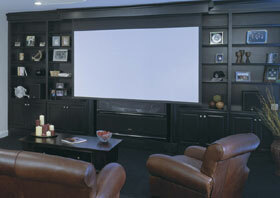 Cineperm - Features heat bonded 2" black snap-to border for protection against runs and 2" aluminum frame. Even surface tension minimizes screen draping. 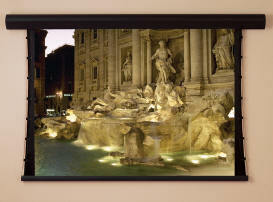 Clarion - Simple installation with 2" beveled black aluminum frame. Viewing surface is perfectly flat for perfect picture quality. Veltex textile coating available to reduce light spill. Clarion w/Veltex - Same as above, but has Veltex included. Onyx - Assembles in about 10 minutes. 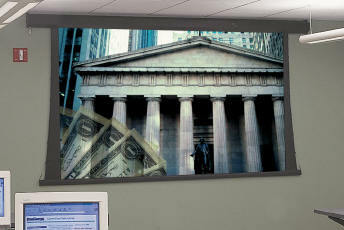 Front or rear projection with 4" wide beveled black aluminum frame. Screen surface is perfectly flat. Veltex textile coating available to reduce light spill. Onyx w/Veltex - Same as above, but has Veltex included. ShadowBox Clarion - Black aluminum 2" boxed border. Fabric snaps to 2” aluminum frame for flat viewing surface. Veltex textile coating available to reduce light spill. Cinefold w/Heavy Duty Legs - Similar to the Cinefold. Ships with HD legs for larger screen surfaces. Optional velour dress kits available. Ships silver. Black anodized finish available. 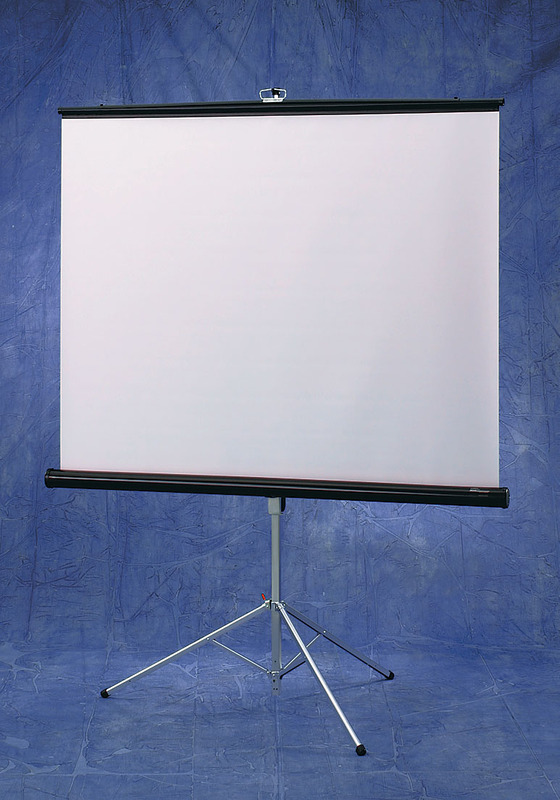 Truss-Style Cinefold - For virtually any size presentation. Features extra rigid truss style frame with special frame stiffeners. 6” black borders to conceal truss frame. Includes rugged molded PE carry case with wheels. Optional velour dress kits available. Ultimate Folding Screen w/Heavy Duty Legs - Similar to the Ultimate Folding Screen but includes HD legs for larger screen sizes. Consul - Lightweight and durable. Ideal for schools. Black case with matching end caps. Case udjusts to any level on tripod upright. Optional skirts available. Diplomat - Simple and rugged. Easy to set up. Exclusive Bell Lock eliminates risk of bent or broken legs during transportation and set up. Black case with matching end caps. - All the best features of the Diplomat made more durable. Case is scratch resistant with baked on black plastisol on steel. - Same as above but includes black carpeted case. Luma 2/R - Large spring roller heavy duty portable screen with floor stand. Ships white. Black available. Luma 2/R w/Black Carpeted Case - Same as above but includes black carpeted case. Piper - Entirely self contained in extruded aluminum case with black powder coat finish. Features built in carry handle. Easy to set up. Black “rise” below image area. Optional carry case available. RoadWarrior - Tubular lightweight black aluminum case. Easy set up. Features scissor mechanism with pneumatic cylinders to hold screen at desired height. Screen raises at the touch of a finger. Includes 30’ black “rise” to clear a standard table top. 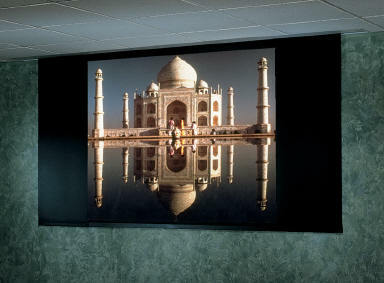 Traveller - The ultimate portable projection screen. Light weight and very cost effective. Durable with a built in carry handle. Shoulder strap also included. Telescoping twist lock support to extend screen to desired height. Ships black. 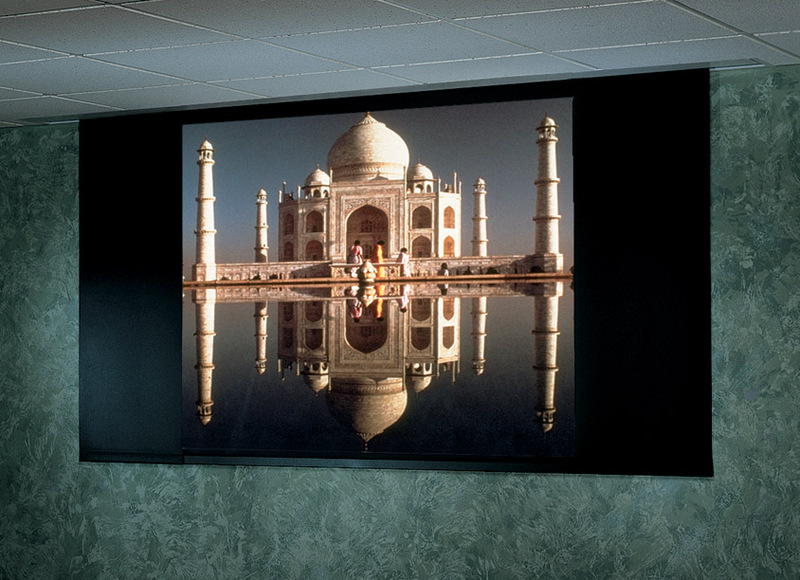 DiamondScreen - Largest vertical viewing cone of any product of it’s type. Molded surface derived phenomenal optical performance from it’s patented Fresnel / lenticular lens system. 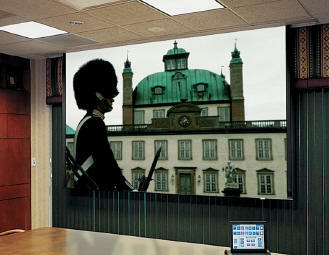 HoloView - Ideal for high traffic areas where maximum impact is required – image appears to float in space. 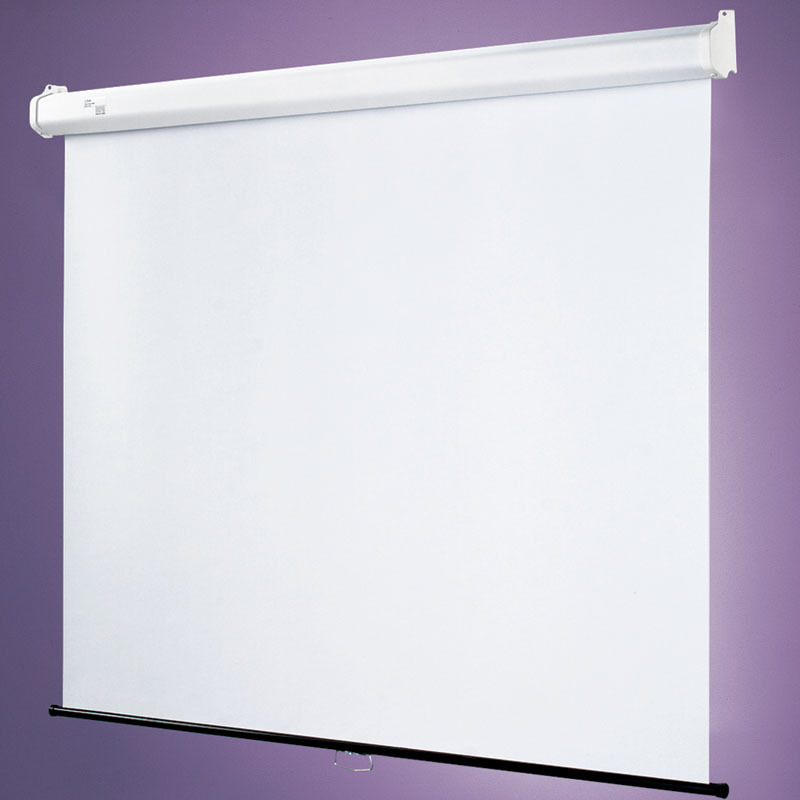 Can be installed in a standing support, window, or suspended. 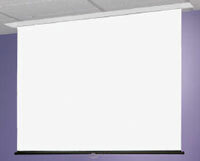 IRUS - Developed specifically for high resolution single lens projectors. Incredible uniformity for hot spot free operation. Excellent color and contrast performance. Ideal for areas where ambient light can’t be controlled. Vortex - A 0.5 mm Fresnel lens gathers the light from the projector and directs it at a right angle through the screen. As the light exits the screen on the audience side, a diffusion medium redistributes the light evenly in all directions—up, down, left, right and center. Excellent resolution and color contrast with exceptional uniformity.